You can find a great planner for Fallen Earth ability points at http://www.fallenearthplanner.info. It has been created by Fallen Earth Player Psychic. 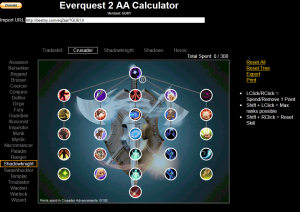 It allows you to experiment with the distribution of AP, assigning them to various skills and stats. 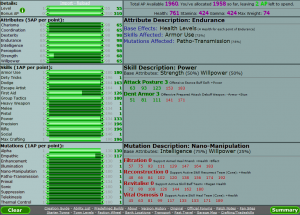 It displays ability levels and thresholds at which you can train those abilities. It also features a good deal of game information, like predefined builds, maps, travel locations, mounts. 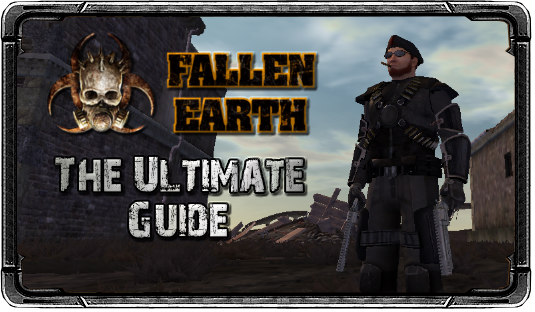 A complete guide for Fallen Earth V2.0, Free-to-Play has been created by “Red Falcon”, clan leader of Death Row Loot Party. The guide aims at covering all the basics a new player needs to know, starting with installation and the user interface all the way to maps, character builds and selected mission guides. Like we do in every game, DRLP created an Ultimate guide to the game itself, including all the informations the game doesn’t tell you, in an in-depth, accurate way. The guide is constantly updated as soon as we discover something: every day something new may be present. If you want to contribute you are free do to so and we thank you for that. It’s a good idea to send people in need of help from Help Channel chat to this guide, in order to clear most of their doubts and have an answer to most questions packed in a link.